Welcome to my “barn.” This blog is one way that I instruct, encourage, and challenge the dear folks I am privileged to serve as pastor, Orwell Bible Church. If others benefit, that’s great, but my purpose and objective is to be a help and encouragement to OBC. What kind of things will I write about? Well, for one thing, I love barns! I fondly remember spending hours and hours playing in my grandpa’s barn growing up. I wish I had one now! Sadly, with the advent of modern technology and new farming methods, barns don’t have the prominence that they used to, so you’ll see a lot of dilapidated barns. Barns have many different purposes: house animals, store feed, keep and repair equipment, and milk cows (if it’s a dairy farm). The barn theme conveys the idea that I’m giving something that will be helpful to my readers (don’t worry–you’re not a cow, horse, goat, or chicken!). What Does Di Sheiyah Mean? Di Sheiyah is Pennyslvania Dutch – Amish – for the barn. Having grown up in rural west Michigan (the metropolis of Alto) and living again in a rural area (Orwell, OH) with a large number of Amish around, it seemed natural to choose this as a name. 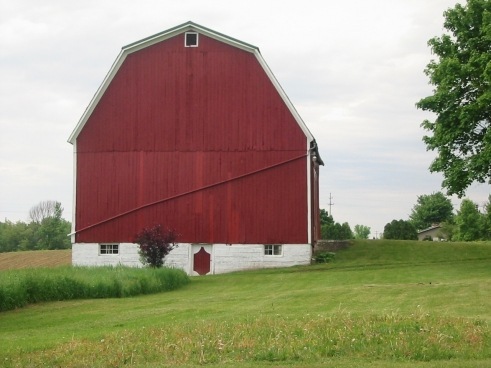 What Are the Sections of a Barn? The “Stalls” lists the various categories that posts are organized under. If you want to find something dealing with a particular topic, click on “select category” and then select the category you’re interested in, and all posts so designated will be listed for you. Haylofts are used for storing hay. My “Hayloft” is where all the posts are stored by date. The “Almanac” is a calendar that highlights the dates when I post something. Silos are used for storing grain or silage. My “Silo” page has large files that give a more indepth discussion than a blog post. You can can click on these to read or download.